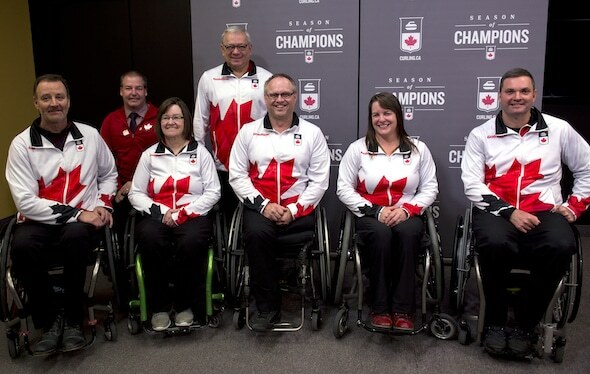 A veteran-laden lineup has met the criteria for nomination to the Canadian Paralympic Committee to represent this country in wheelchair curling at the 2018 Winter Paralympic Games in Pyeongchang, South Korea, it was announced today by Curling Canada. 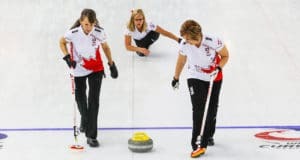 Three members of Canada’s gold-medal team four years ago in Sochi, Russia, have been nominated to the Canadian Paralympic Committee, as have two athletes with no past Paralympic experience, as Canada takes aim at an unprecedented fourth consecutive Paralympic wheelchair curling gold medal. Mark Ideson (London, Ont.) was the lead of the team that won gold in Sochi, but will now take over the reins at skip. Two-time gold-medallist Ina Forrest (Armstrong, B.C.) will reprise her role as vice-skip, while Dennis Thiessen (Sanford, Man.) will return as second. Lead Marie Wright (Moose Jaw, Sask. ), who represented Canada at the 2017 World Championship in Pyeongchang, was selected to fill out the roster and return to South Korea in March. Alternate James Anseeuw (Oak Bluff, Man.) will wear the Maple Leaf for the first time in international play. Thiessen, Wright and Anseeuw are all two-time Canadian wheelchair curling champions; Thiessen and Anseeuw were teammates representing Manitoba in 2017 and 2014, while Wright was part of Saskatchewan’s gold-medal teams in 2016 and 2012. The Canadian Paralympic Committee will officially name the Canadian Paralympic Team early next year. Wayne Kiel (Balgonie, Sask.) will act as team coach in his first Paralympics; he was an assistant coach of the victorious Canadian team in Sochi. 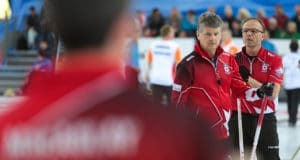 “Canada’s curlers are the best in the world, and our athletes have the gold medals to prove it,” said the Honourable Kent Hehr, Minister of Sport and Persons with Disabilities. 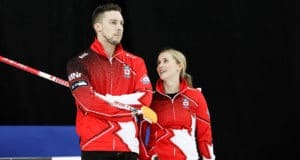 “This is a team Canadians can be extremely proud of for the hard work and dedication all five athletes, as well as their coaches and support team members, have put in to reach this level,” added Katherine Henderson, Chief Executive Officer of Curling Canada. Wheelchair curling made its Paralympic debut in the 2006 Torino games, and Canada has claimed gold at each of the three games since. In 2006 at Torino, Italy, it was Chris Daw skipping Canada to the gold medal, while in 2010 at Vancouver and four years ago in Sochi, it was Jim Armstrong skipping the Canadian team. The Canadian team nominated to the Winter Paralympic Games will be rounded out by Team Leader Wendy Morgan (Burlington, Ont. ), Performance Consultant Kyle Paquette (Gatineau, Que. ), Physiotherapist Sari Shatil (London, Ont. ), Team Physician Dr. Steven Dilkas (Toronto) and Media Attaché Brian Chick (Toronto). Morgan has been the wheelchair curling Team Leader at all three previous Paralympic Winter Games. The Winter Paralympic Games run from March 8 -18, 2018 in Pyeongchang, South Korea, with the curling competition being staged at the Gangneung Curling Centre, which also hosted the 2017 World Wheelchair Curling Championship. Ten wheelchair curling teams will play a round robin, after which the top four will play in the medal round.